TM1, Other Microphone from Audix. 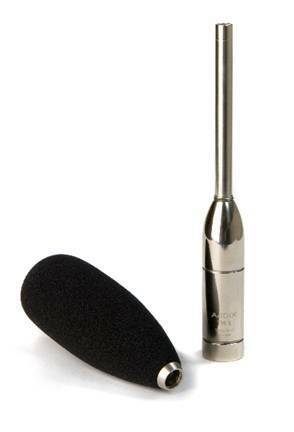 Audix introduced the TM1, a 6mm pre-polarized condenser microphone used for test and measurement applications. The TM1 is designed to capture acoustic measurements for room analysis software programs, real time analyzers and other sound control devices. The TM1, which the company says is characterized with a uniformly controlled omni-directional polar pattern and an extremely flat frequency range over 20 Hz – 25 kHz, is an excellent tool for sound engineers, sound companies, and recording enthusiasts. Requiring 18 - 52 Volts phantom power for operation, the TM1 features a machined 4-stage brass body and capsule housing, nickel plate finish, Switchcraft XLR, shock absorbent O-rings, and snap to fit mic clip. Optional accessories include an innovative acoustic foam windscreen (WS-TM1) that threads onto the microphone housing for secure and stable operation, and a shockmount adapter (SMT-TM1). MSRP for the TM1 is $299. For more information, visit www.audixusa.com. New Audix Podium Mics Audix introduced the MG12, MG15, and MG18 which are miniature gooseneck condenser microphones modeled after the innovative Micros Series. Onyx-i/Pro Tools M-Powered 8 Compatibility Mackie announced a free driver upgrade designed to instantly connect Onyx-i FireWire Production Mixers with Pro Tools M-Powered 8. Genelec 8260A Genelec is now shipping its new 8260A Three-Way DSP System.